Yve for Aiko 3 is perhaps the most beautiful Aiko 3 character ever created by Illusions Designs. She has tremendous skin color and definition, great body and facial features and she renders excellent with any light set. She comes with beautiful make up and eye color texture sets and and 3 incredible second skin mats. Scroll down and see how Yve A3 is definitely a must on your Runtime folder. 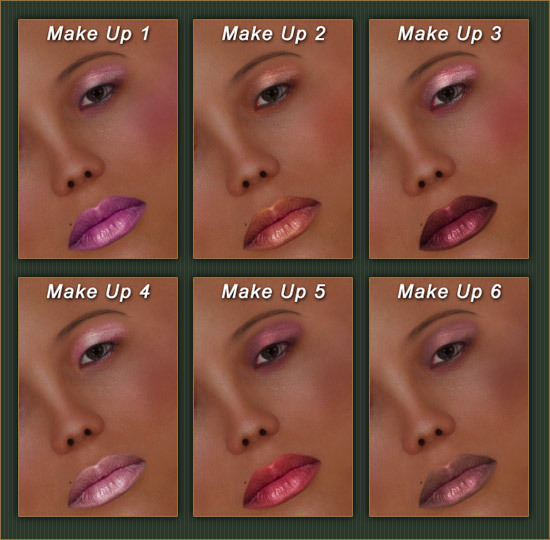 Default head and body textures, default eye color and default face morphs shown. Image has no post work. Hair is not included. Default head and body textures, default eye color and default face and body morphs shown. Images have no post work except composition. Hair is not included. 3 (three) simple but gorgeous lace style second skin mats.
? You must have Aiko 3 base plus complete set of head and body morphs installed in order to use this product. A snapshot of the Poser desktop soon after the Yve for Aiko 3 package was finished.